Did you know that an art easel is one of the best educational equipment for kids in the world? With it being able to develop and promote many beneficial skills and abilities, it is one you must not miss out on. This is why we have prepared this article of the best art easels you can find to help you decide which one to buy. A lot of adults and parents tend to think that easels are pieces of the art equipment that kids only use at school. This then prevents them from going out to buy one for their child to use at home. But what if we tell you that this great educational equipment for kids can also be used safely at home too. 1.6.1 Why Is It Important for Kids To Play With Easel Boards? 1.6.2 Where Is The Best Place To Set Up An Easel Board At Home? 1.6.3 Top Places To Buy An Easel Set? By not having an easel board for kids at home you could potentially be preventing your child from developing their minds and body at a much faster pace. Therefore we have decided to give you a brief explanation of the possible benefits that an easel set can bring to your child so that you are aware of. Promote active play – By standing and moving around, your child is able to be active when playing with this toy and not become lazy. Promote gameplay – This equipment gives your children a game to play against each other by competing to draw or write for example. Educational – It has the potential to teach your kids new words and help to improve their writing and drawing skills. Gives confidence – By practicing to stand and draw or write it prepares them for the inevitable presentation assignments they will get in future studies. Below we have for you our list of the best art easel to buy in the market so that you can buy the one that best suits your child’s preferences. We understand that some of you have different circumstances that can prevent you from getting the one you want. This is why we hope this list can give you an idea of the best alternative one. The first easel set we would love to introduce to you is the Flip To Draw Easel Desk which is the most exciting one we have on our list. Kids will surely love this easel because it has many different compartments to store a lot of their best play equipment. These compartments include the molded trays to store pens and coloring accessories, cup holders, one stool and a magnetic flipping board. These are located on the front of the table with four additional bins on the back and a bookshelf to help store bigger and larger accessories such as books. This means that you can expect them to spend a lot of time working on this table jumping from activity to activity so this will not be a waste of money. One thing you need to be careful about is whether you decide to fix this table because once it has been assembled it can’t be undone unless it’s broken. It can be rearranged in the room you assemble it in but may be difficult to fit through doors to put into different rooms due to its dimensions of 29 by 23.8 by 26 inches. This kids Easel Desk is ideally recommended for children between the ages of 2 and 8 years. This is mainly because of the size of it being at a good height for an average child of this age. It also isn’t as heavy as it looks and only weighs 18 lbs, therefore carrying it wouldn’t be as difficult as you may think. The reason why this art easel for kids is one of the best is that it can be used whilst sitting or standing unlike some of the other ones. Not only does this increase active play but encourages them to use it for a longer period of time. This Wooden Artist Easel by Melissa and Doug is a clever piece of equipment is made in with a bi-fold standing option to give two children the chance to use it at the same time. Once they finish it can easily be folded flat to give more convenience when trying to put away. It is made with a really strong wooden frame and is helped to keep in position by wooden clips. These are very easy to set up which means kids are able to get it up and ready to use by themselves, although we recommend you be sensible about their physical capabilities. As well as the board, the whole set includes paper roll holders, safety scissors, 4 slip grips, and 2 plastic trays. Although it would have been much better if it came with kids art supplies too. Therefore we warn you that these are to be bought separately and can sometimes be costly. We recommend that you are careful when lifting it due to it weighing a reasonable 21 kg. But it is also only 74 cm tall and 64 cm wide. This means that it is the perfect size for an average of 3 to 5 year old child and also can fit through any normal doors. This is one of the simplest yet amazing easel sets you can buy for your kids. As you can see, it is able to turn all the way around and be kept still in any position to make it more convenient to use. As well as the board, this easel comes with some art accessories to give your kids some ideas on what to do with it. For example, your kids can stick up to 81 magnetic letters on it to spell out different words. This can ultimately help to improve their spelling. With this being made of metal it means the size of it can be adjusted to best suit the height of any child between the age of 3 to 8 years old. From 29.5 to 44 inches, all children can use this toy in any way they want. As well as it being an easel, this brilliant educational accessory for kids can be turned into a desk that can hold weight as heavy as a laptop. This means that it can also be used as a painting desk to save you money from buying an actual painting desk. It is made from aluminum allow metal which is really hard to break and completely safe at the same time. Although most metals are heavy, this product only weighs 3 kg meaning it can be super portable unlike some of the other products on this list. One side of this easel has a chalkboard and the other had a whiteboard which means it can be used with different writing/drawing pens. And its measurements are 18 inches wide and 24 inches tall which allows enough space for kids to make large drawings on. Some of you may be thinking that your kids may not wish to stand and draw in one place for long periods of time. This is why we have chosen this Tabletop Easel board for you to consider buying for them. Although it has the word tabletop in the name, it does not necessarily mean that this is the only place it is designed to be used. One can simply place it on the floor and sit to draw if they wish to as a lot of kids could feel more comfortable like this. With a weight of just 2.27 kg, this piece of art equipment is able to be easily transported from one place to another for a more convenient location. This means that it can even be taken outside on a nice sunny day for your kids to draw whatever looks attractive to them outside. Dont be fooled by its size as it is made from really strong pieces of wood that can stably stand without assistance. It then can easily be folded to bring convenience when putting it away. It is designed with a paper roll holder and comes with a 12 inch paper roll for kids to use. This gives your child the capability of using a dry-erase board, a chalkboard and paper if they wish. The best thing about this educational toy set is that it comes with some of its accessories. For instance, the pack contains 5 pieces of coloured chalk with an eraser, a dry-erase marker and 36 magnetic letters and numbers. The fact that it is small means that it is suitable for children from the ages of 3 years and above. However, you must know that it measures 20 cm by 17 cm which should show you that it has more than enough space to meet the children’s needs. 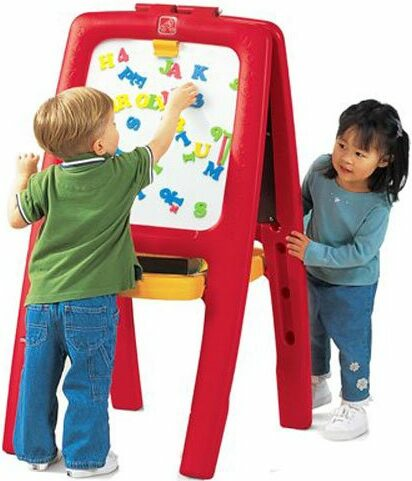 This is a fantastically designed easel toy for kids made to bring a lot of fun and educational benefits to them. For instance, it’s a unique magnetic board along with 94 pieces of foam magnetic letters allow kids to play a word guessing game. With its double sided effect, it allows your kids to stand on opposite sides to one another to prevent them from cheating. This inevitably will develop their spelling skills as well as improve their confidence it writing. In order to give this piece of equipment more capabilities, it is designed with a dry easel board on the opposite side. Kids are able to use chalk as well as pens to write and draw on it. Although you shouldn’t expect to receive any of these with the board as it doesn’t come with any art supplies. Made from high quality plastic, this board has four strong and stable legs that cannot be bent so easily. It gives children the possibility to both work on it at the same time without it wobbling. However, some kids can find it tiring to stand and work on it for long periods of time, although this can be fixed by possibly buying them a separate stool to sit on whilst working. The only additional items it comes with are the two easily removable trays for the art supplies to be placed at. Even though they can be removed, it still weighs a heavy 15 pounds so we would recommend a two man lift when moving it around. One important tip we would advise is children not to run around near this equipment whilst it’s left out in the open. We say this to prevent your kids from tripping over it and potentially causing an injury to them and also to maximise its safety. Why Is It Important for Kids To Play With Easel Boards? By now we are sure you are aware of what children can benefit from by using an art easel. However, one of the most important reasons why it is crucial they play with easels is to promote a good imagination and give your kids an advantage at school. As parents, we all know about the fear we have about our kids not being able to fit in or not being ready for school. By buying them one of these educational toys for kids, you will be relieved when this time comes as you can rest assured your child is well prepared for school. Where Is The Best Place To Set Up An Easel Board At Home? Usually, we would recommend that this play equipment for kids is set up in your childs bedroom because it gives them their own space and privacy. However, if you live in a house with extra rooms then it would be ideal to turn one room specifically into an activity room where you can place this in one corner and never have to move it if not necessary. Top Places To Buy An Easel Set? For some of you, this may be the first time trying to purchase one of these educational equipment for kids. This can make you clueless to where to start looking for them so we’re here to tell you that they can be bought from all major arts and crafts stores. However, we would recommend you purchase one online as this becomes much more convenient for you. The best online retailer is Amazon where you can instantly be directed to through our links.